There are endless things to do in Chicago and the city surprised us (in a good way) with its bustling downtown core, expansive green spaces, modern art displays, Michelin-starred restaurants and charming neighbourhoods. No matter your age or travel style, you’ll find sights and activities in Chicago that will pique your interest. We recently spent a week in the Windy City and could have lingered much longer. With so many exciting things to do in Chicago (and eat! ), try to give yourself at least 5 days to explore. And, contrary to belief, this city is actually one of the best places to visit in January due to having so many indoor sights and amazing festivals during that time. 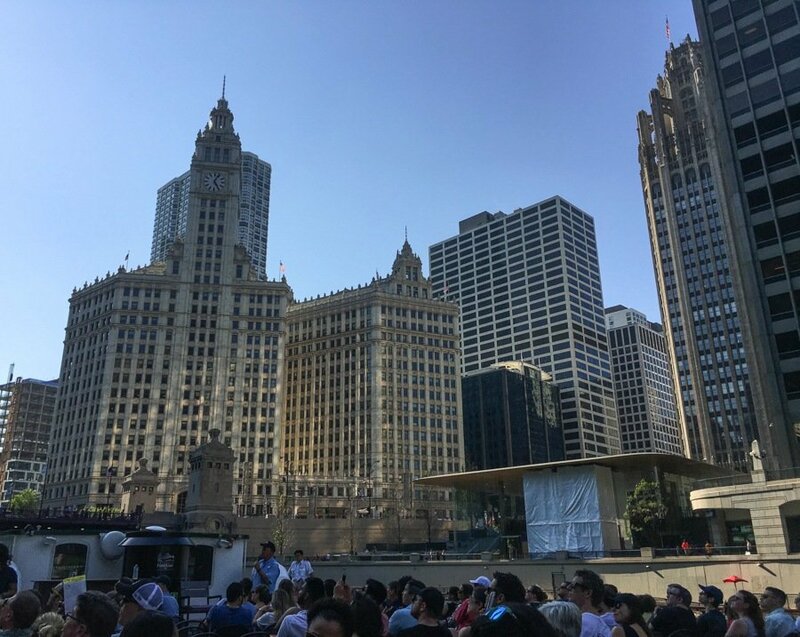 In this article, I’m going to list not only the obvious things to do in Chicago, but some of the more off-track sites and experiences that we had – and highly recommend. Note: Don’t miss our travel video of Chicago at the end of this post! Thankfully, even though Chicago is a sprawling city of just under 3 million people, the efficient transportation systems make getting around easy and stress-free, with elevated rail lines giving you excellent views of the city while you ride. Taking public transport (CTA – Chicago Transit Authority) from the airport is the most budget friendly option. It’s also very straightforward. The Blue Line runs 24 hours from the O’Hare Airport to downtown Chicago. The journey takes about 40-45 minutes and the cost is $5 (less if you have an unlimited ride pass which you can pick up at the airport and at vending machines around the city). If you’re arriving at the Chicago Midway International Airport, you can hop on the Orange Line for a 20-25 minute ride to the downtown loop area. To pay for these journeys, purchase a Ventra card from one of the vending machines at the airport train stations, at Ventra Vending Machines, or over 1,000 Ventra Retailers around the city. You can buy 1 journey, 1 day or 3 day tickets. The machines accept cash, credit or debit. Click here to learn more about the transport options from the Chicago airports to the downtown area. Once you’re in the city, the best ways to get around Chicago are by walking and cycling, or by train, bus and ride share. You’ll need to figure out how many times you think you’ll take the CTA buses or trains, and then purchase the appropriate Ventra Card. If you think you’ll only ride the train or bus a couple of times, you can save money by purchasing individual rides (usually $2.50) and pay as you go. For maps of the various train lines in the city, click here. Uber and Lyft are the most popular ride share companies in Chicago and are frequently used by locals and visitors. I recommend downloading the Uber and Lyft apps so you can easily get around and enjoy all of the things to do in Chicago. Google Maps also allows you to call ride shares directly from the app, so you can decide if you want to walk the distance, cycle, use public transport or call an Uber. The cost of the CityPass is $106 for adults and $89 for children aged 3 – 11, and it’s valid for 9 consecutive days. If you were to visit all of the attractions listed above without the CityPass, it would cost you $217.90. You need to first decide how many attractions you want to visit while in Chicago and figure out if the CityPass is right for you. Click here to learn more and to purchase the pass. 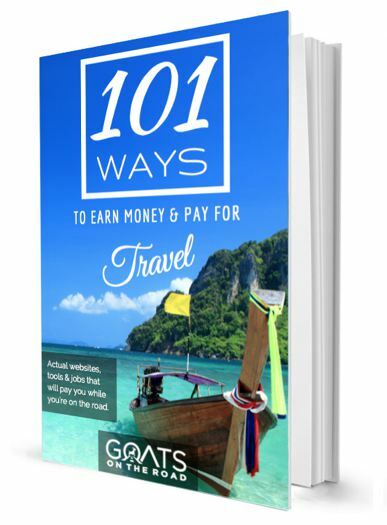 1 day – $109 for adults, $69 for kids. 2 days – $154 for adults, $109 for kids. 3 days – $184 for adults, $129 for kids. 5 days – $219 for adults, $149 for kids. By my calculations, if you were to visit the SkyDeck ($24), 360 Chicago ($23), Art Institute of Chicago with Fast Pass ($35), the Ferris Wheel at the Navy Pier ($15) and the Architecture River Cruise ($43), then the cost would be $140, making the 1 day pass worthwhile…and it’s only $14 shy of the cost of the 2 day pass. For more information and details, and to purchase the Go Chicago Card, click here. Here’s my guide for the top 27 things to do in Chicago during your next trip. I had to put this first on the list. Taking transport is a great way to get around the city, but by walking, you’ll be able to experience all of the in-between bits that makes Chicago so great – plus, you’ll be able to burn off some of those calories you’ve consumed after eating so well! Gaze up at the towering skyscrapers in the downtown area, or saunter down quiet streets in one of the 77+ surrounding neighbourhoods. There are no real hills, the sidewalks are well taken care of and you don’t need to worry about falling off any uneven curbs. If you get tired, call an Uber or hop on the train. Taste of Chicago: this food / music festival has been running since 1980 and is the largest food festival in the world! Here you’ll enjoy cuisine from around the globe – Indian, Thai, American, Caribbean, Mexican, European and much more. The grounds at Grant Park are free to enter, but you purchase tickets to exchange for samples of food, or full meals. A strip of 14 tickets will run you $10 and a taster portion of food will cost you about 6 tickets. Make sure you bring your own water though, because 500mL of bottled water at the festival will cost you $8! 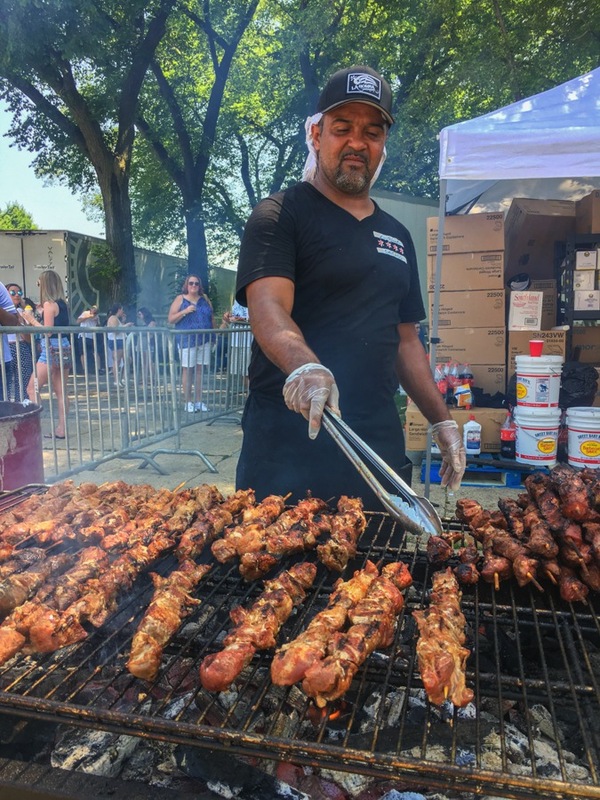 Click here to learn more about the Taste of Chicago, which is held in July. Windy City Smokeout: for BBQ, beer and country music fans, this festival is one you don’t want to miss! We really feel like this is one of the best things to do in Chicago in the summer and it was probably our favourite festival during our 5 day visit. There’s a grandstand here which hosts the main music performances, plus another smaller stage towards the back. Wander around and let your nose guide you towards billowing smokers, where 20+ pitmasters from around the country grill up tender meat. 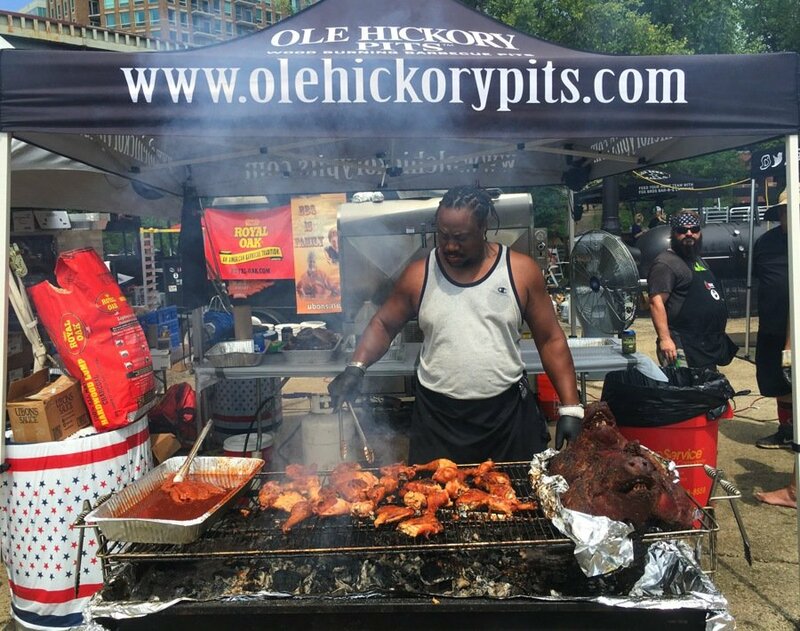 There’s no shortage of succulent, smokey ribs, tasty brisket, pit roasted pork and grilled chicken at this event. Also, make sure to sample some of the craft beers on tap, many of which are from Chicago – we recommend the IPAs from Moody and Tongue and Goose Island. Click here to learn more about the fun Windy City Smokeout event, which is held in July. Grant Park Music Festival: if you’re into classical music, chorus, orchestras and FREE concerts, then don’t miss this one. Grab some lawn chairs or a blanket, pack a picnic and some wine and head down to Millennium Park at the Jay Pritzker Pavillion. This classical music festival is held yearly for 10 weeks from June to August, and has been for more than 80 years. Click here to learn more about the Grant Park Music Festival. Chicago Blues Festival: incredibly, this is another free festival in Chicago! Not only is entrance free, but it’s the largest music festival in the city. Head down to Millennium Park for the weekend of Jun 8 – 10th and enjoy the show. (more about Blues music in #22 on this list). 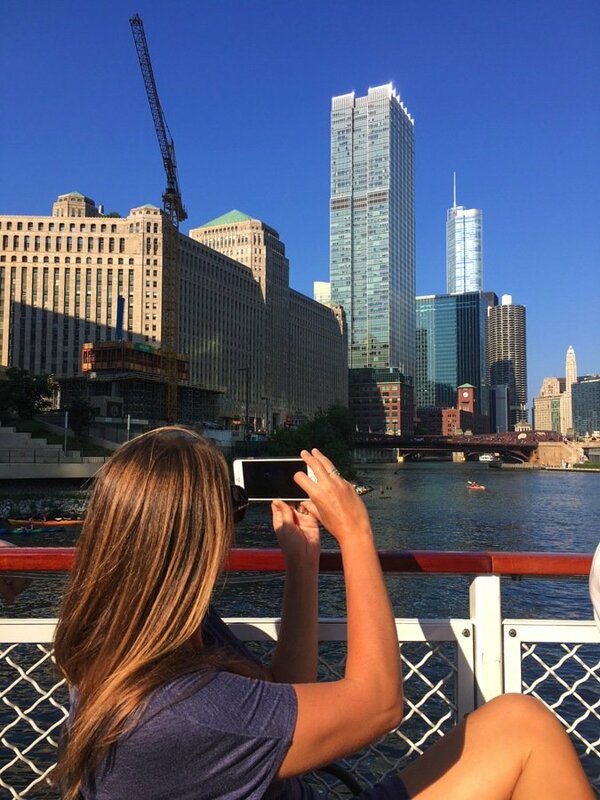 Even if architecture really isn’t your thing, don’t miss the Chicago Architecture River Cruise. Chicago has numerous towering skyscrapers, and smaller warehouses along the Chicago River, all of which have a story. Rather than guessing for yourself, the guide on the boat tour will give you some history and describe the design style, all while you sip on a beer and enjoy the sunshine. We joined the Chicago Architecture Foundation Center River Cruise aboard Chicago’s First Lady and enjoyed the trip. The guide provided excellent information, there was a bathroom and a bar onboard and the ship was quite comfortable. 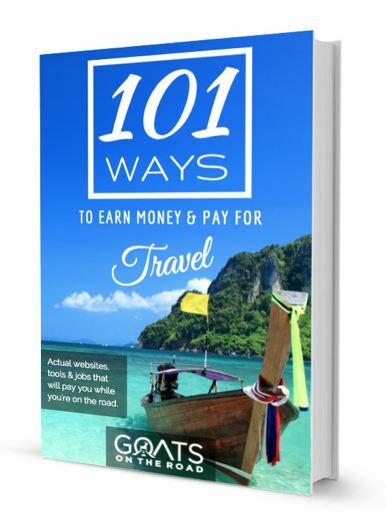 The tour is highly rated on TripAdvisor. There are numerous companies to go with. Shoreline Sightseeing is another highly rated option. 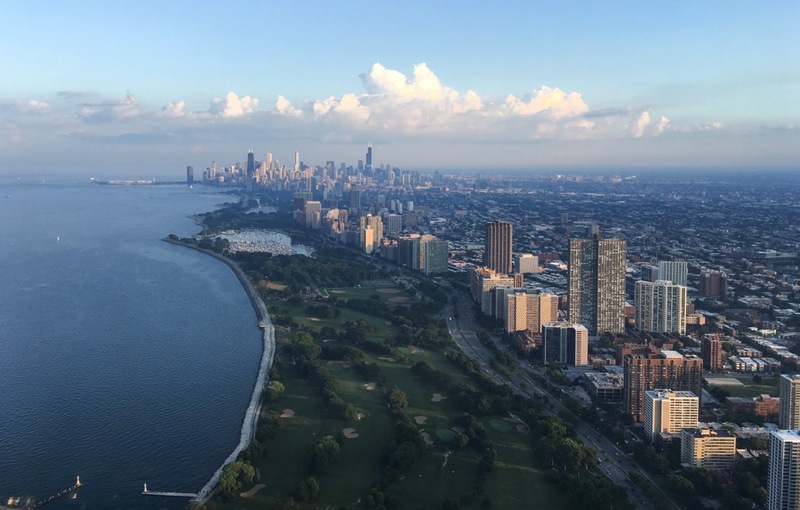 After you’ve seen Chicago by foot and by boat, it’s time to get an aerial view of the city. A helicopter ride is on pretty much everyone’s bucketlist and after flying high above Chicago on a sunset trip, I can say that this truly is something you don’t want to miss. Together with 5 other people (plus the pilot), you’ll don a headset and soar above Chicago, passing by the Lakefront, Navy Pier and more. The pilot provides information about the buildings down below and will answer any questions you have. *Pro tip: bring a GoPro camera or some sort of fish eye lens for your smartphone, as it’s hard to get selfies in such a contained space. As I said above, there are over 77 neighbourhoods in Chicago – each with its own vibe and things to do. Being downtown is great, but try to visit a few of the different neighbourhoods in Chicago. 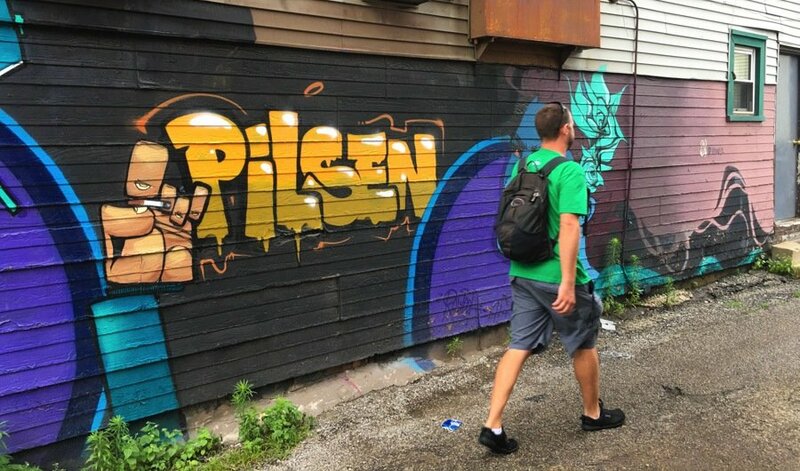 Our favourite was Pilsen, which was once a predominantly Slavic community, but since the 1960’s it has been home to many Hispanic residents, mostly Mexicans. 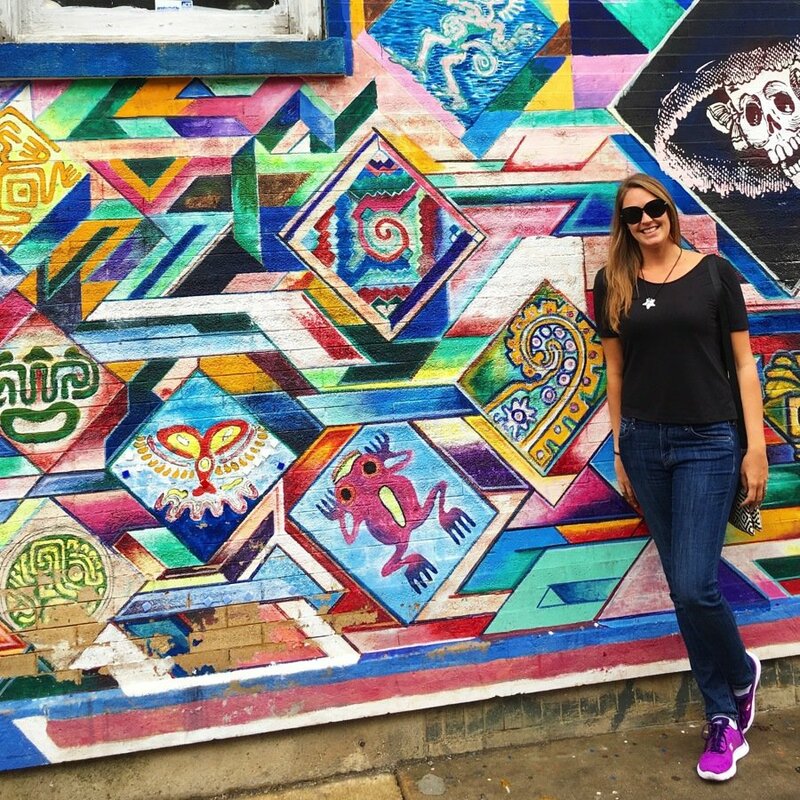 Pilsen offers bright street art, Mexican food, the National Museum of Mexican Art and the Thalia Music Hall. Make sure you visit the Mexican museum here to learn about the current issue of gentrification that is effecting Pilsen and some other parts of Chicago. Wander around at your own pace and enjoy the ‘hood. Stop in at Jumping Bean for coffee, Canton Regio for Mexican food (and BYOB! ), and Michelin starred Dusek’s Board & Beer for tasty cuisine and beers. 3 – 4 hours in Pilsen is plenty of time to explore many of the back streets and funky shops. 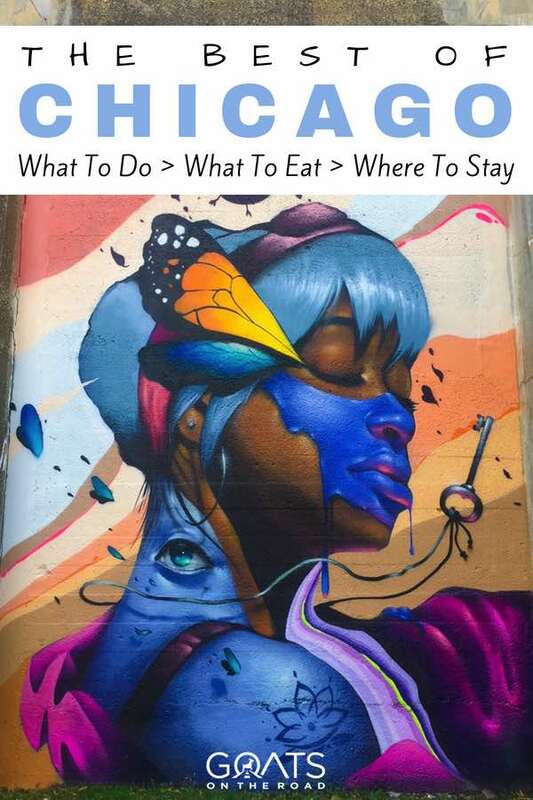 Near West Side: offering fantastic restaurant choices, boutique shops and street art (check out Randolph Street and Fulton Market), this is the foodie hotspot. Check out Michelin starred Girl and The Goat restaurant and have a coffee at the trendy Soho House. Wicker Park / Bucktown: known for vintage shops, craft cocktails and chilled out spots, spend an afternoon here shopping, dining and checking out the 606 which runs through these neighbourhoods (more on the 606 at #10 on this list). Grab a brew from MapRoom Taphouse, or cool off with an Italian Ice from Miko’s. Logan Square: an area with a strong sense of community and support of local businesses…with a side of hipster vibes, craft beer and live music. Here you’ll find some of Chicago’s best restaurants, don’t miss Fat Rice (Macanese fusion) and Mi Tocaya Antojeria (Mexican cuisine). Lincoln Park: a mix of city and nature, Lincoln Park offers a massive greenspace complete with a lakefront trail and sandy beaches. In this neighbourhood you can listen to blues music, party all night long, go shopping at trendy boutiques, or grab a bike and ride the trails. Try a hotdog from Wiener’s Circle (more on that at #9 on this list) and some Korean chicken at Crisp. Andersonville: this fun area is home to one of Chicago’s largest gay communities, and is known for being a diverse part of the city. Go to the theatre, devour a tasty burger at Little Bad Wolf and sip on a craft beer from Hopleaf. 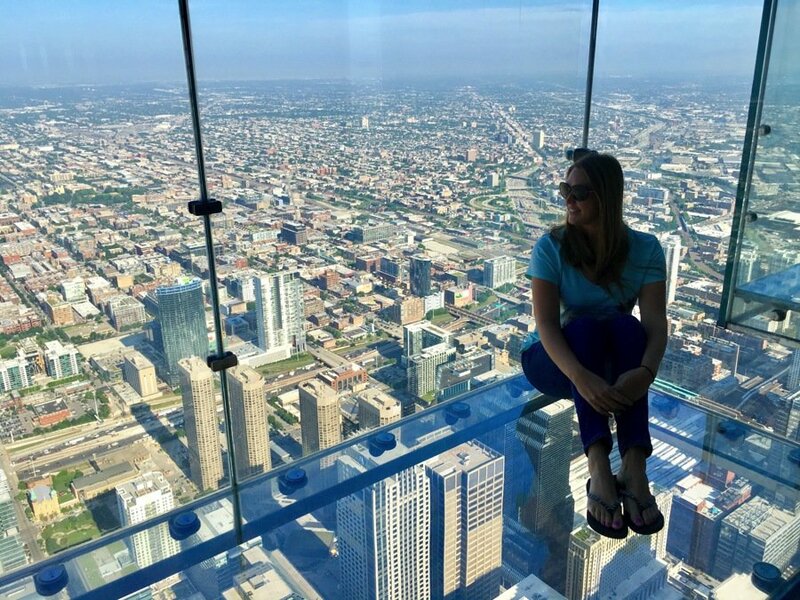 Conquer your fears and head to the SkyDeck Observatory at the Willis Tower (Sears Tower) and enjoy amazing views of Chicago. This is one of the most popular attractions in the city, and for good reason! There are 4 glass boxes (ledges) protruding from the top of the Willis Tower where you can walk out on 1.5 inches of glass. On a clear day, you can see Chicago, plus the 3 neighbouring states of Indiana, Wisconsin and Michigan. 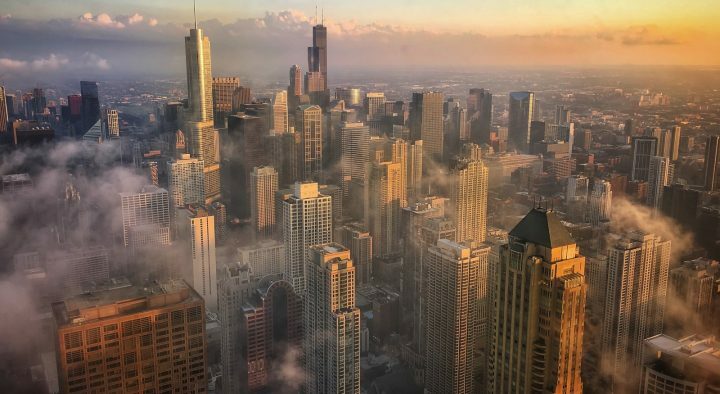 This is one of the most Instagrammed spots in the city, and one of the most popular things to do in Chicago. 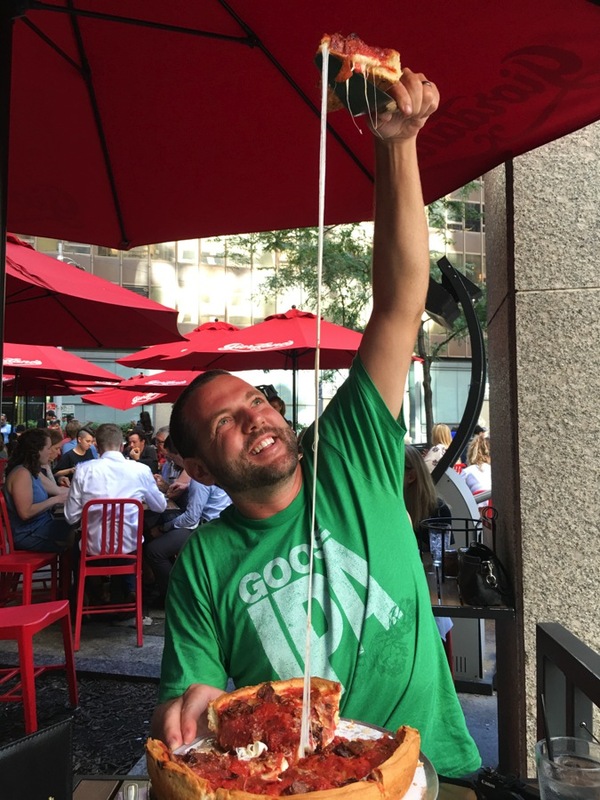 Inevitably, on your quest for things to do in Chicago, you’ll hear a lot of talk about the “best pizza in Chicago”, and, after sampling a couple, we’ve come to the conclusion that our favourite was Giordano’s. Now, there are numerous other places that we didn’t get to sample, so I suggest going on a hunt for the best pizza and seeing what you come up with. Giordano’s offers made to order deep dish and thin crust pizzas – taking around 45 minutes to 1 hour to cook. The pizzas here are tasty, but most importantly, the cheese is incredibly stringy, giving you that ultimate Instagram cheese pull photo. This is one of the best places to eat in Chicago. In my opinion, one of the top things to do in Chicago is to escape the city for a bit and explore the lakefront. At 494 kilometers long and 190 kilometers wide, Lake Michigan is the largest of the Great Lakes and is actually the 6th largest freshwater lake on earth. Looking at it, you’d be forgiven for thinking that it’s actually more of an ocean than a lake as it even has tidal shifts. The Lakefront Trail is an uninterrupted, 29 kilometers (18 miles) long, pedestrian-only route. It’s the perfect place for cycling, roller blading, jogging or walking. Along the way you’ll pass by beautiful beaches, perfect for laying down a towel and going for a swim. 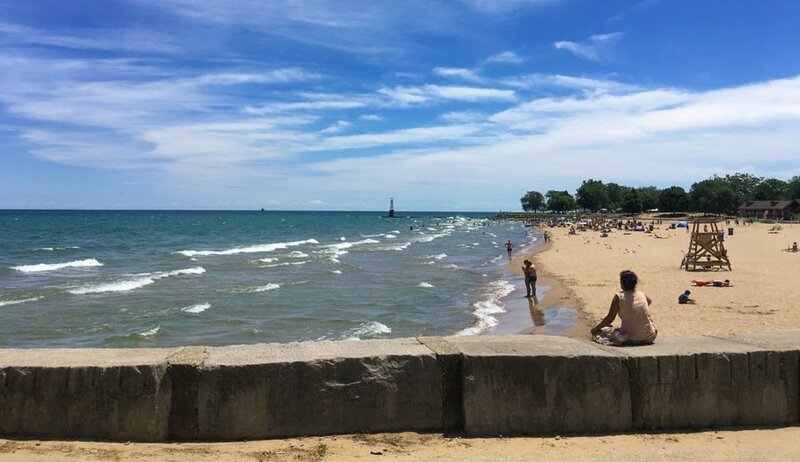 Check out Kathy Osterman Beach and Montrose Beach. Divvy Bikes are a great way to explore Chicago – especially along the vehicle-free Riverwalk, 606 walkway and the Lakefront trail. These shared bikes are affordable and make for a unique way of getting around the city. Whether you want to just get from point a to point b, or spend a day cycling around, these bicycles are a great transportation option. 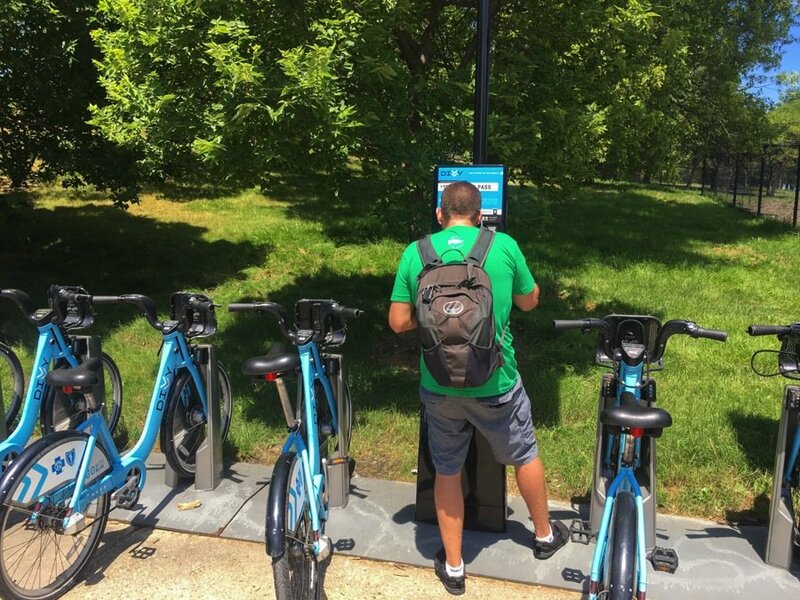 Rent yourself a Divvy bike at one of the stations around Chicago and set off to explore the Lakefront Trail at your own pace. With Divvy bikes, you can rent for 30 minutes ($3) or 24 hours ($15), and pick up and drop off at different locations around the city. Download the Divvy app to learn where to find bike stations, and whether or not there are any bikes currently docked there. *Pro tip: there aren’t any baskets on the front of the bikes, just a bungee cord, so make sure you bring a backpack or something to put your water and sunscreen in. Chicago has numerous iconic foods and snacks, one of which is of course, a hot dog! Eaten at ball games, tailgate parties, BBQs and on the street, sampling a Chicago style dog while you’re here is a must. If you’re looking for a hotdog with a side of sass, profanity and heckling, then make sure to visit The Wieners Circle in Lincoln Park. During the day, it’s a pretty chilled out place, but after 8:00pm and well into the night, it’s a joint that you probably don’t want to bring your kids to. The staff here make fun of patrons, throwing cusses and insults at everyone who enters. We heard the women actually take of their tops if you ask for a chocolate milkshake. It’s all in good fun though and everyone laughs at each other, and themselves. This institution has been here for over 30 years, and is still going strong. Wondering where to stay in Chicago? We stayed in the ideally located Loews Hotel Downtown, and were just steps to the river, Magnificent Mile, Navy Pier and more. There’s a fabulous rooftop bar and lounge area (perfect for a sundowner) and the onsite travel themed “ETA” restaurant serves up tasty, seasonal meals. The rooms are luxurious and comfortable and offer amazing views – either of the cityscape, or the Navy Pier. If you’re feeling energetic, head down to the gym or for a swim in the 75 foot long lap pool, and if you’d rather relax, head to the calming spa. The staff here are warm, welcoming and incredibly helpful! Click here to learn more about the hotel and to book a room. The 606 is to Chicago what the Highline is to New York, and at only 3 years old, it’s one of the newest things to do in Chicago. Once an abandoned railway line, this raised trail and green space is now a place for Chicagoans to cycle, jog, walk, skateboard, or rollerblade away from the traffic – from 6:00am to 11:00pm. Named after the shared zip code prefix of this area of Chicago, the 606 is located in the neighbourhoods of Logan Park, Humboldt Park, Bucktown and Wicker Park and spans 4.3 kilometers (2.7 miles). This is another great spot to rent a Divvy bike! Click here to learn more about the 606 and to see a map of the area. Yet another adrenaline inducing thing to do in Chicago! The “Tilt” is located at the 360 Chicago Observation Deck at the North Michigan Avenue Building (John Hancock Center). If you want to see the city from 314m (1,030 feet) above the ground, while tilting over the building to the streets below, then this is the ride for you. Basically, you stand against a glass wall facing outwards. Holding onto handles, the glass wall then extends and tilts downwards giving you amazing views of the streets and buildings below. If you’re feeling uncomfortable, don’t worry, you’re free to step back away from the glass at anytime. If you just want to visit the 94th floor for a drink and to enjoy the incredible sunset views over the city, that’s also possible. Tilting is just an added attraction. Click here to learn more and to purchase tickets, or click the image below. Popcorn is one of Chicago’s most popular snacks, so before you say “eating popcorn shouldn’t be considered one of the best things to do in Chicago”, try Garrett’s and you’ll realize why it’s on the list. This gourmet popcorn shop is located all around the city and offers various flavours – almond caramel crisp, cheese, butter, cashew caramel, macadamia caramel…or mixed. I recommend the mix of caramel crisp and cheddar cheese. Sweet and savoury! Click here for locations. The Chicago River snakes its way through the city and up until 2016, there wasn’t a way for pedestrians to walk along the river bank. These days, you can enjoy the new riverwalk which runs for 2 kilometers (1.25 miles) from Lakeshore Drive to Lake Street, giving locals and visitors the opportunity to walk, run, dine and relax along the river. This walkway is a great addition to the city. 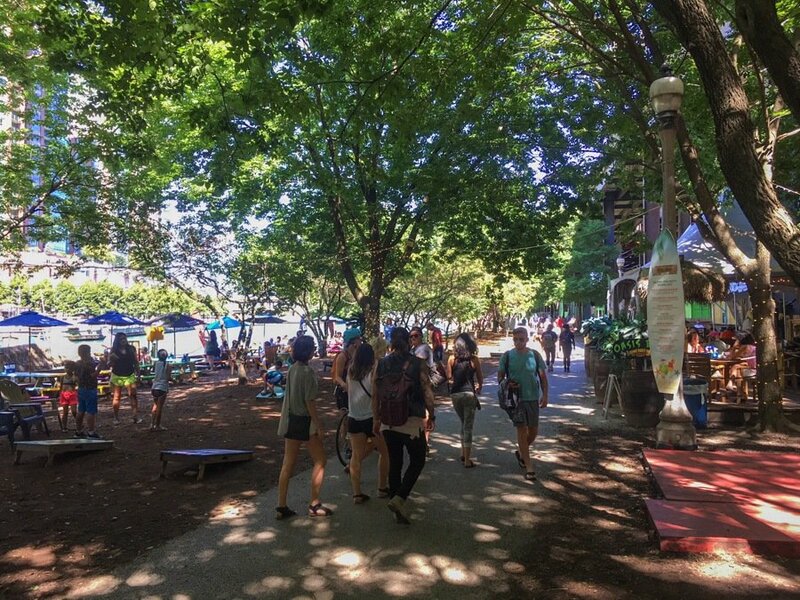 Not only can you enjoy some vehicle-free exercise, check out the public art and enjoy the surrounding architecture, but there are numerous places to eat and drink! Pull up a chair, play some games, or watch the boats go by at the Island Party Hut (beers $7.50, cocktails $14). Grab a glass of wine and some appetizers and people watch at City Winery, or devour some BBQ while enjoying live music at Tiny Tapp. As with most big cities in the world, Chicago is home to an incredible shopping scene. From high-end fashion and cute boutiques to low-cost outlets and chains, there’s a shop for you in Chicago. The Magnificent Mile spans 8 city blocks from Michigan Avenue Bridge to Oak Street and is one of the top spots for shopping in the city. Here you’ll find designer shops such as Burberry, Chanel, Giorgio Armani and Ralph Lauren, standing next to the department stores of Saks, Bloomingdale’s, Nordstrom, Macy’s and Neiman Marcus. Mixed in with all of these stand alone shops, you’ll find 3 malls offering souvenirs, toys, sporting goods, makeup and of course, clothing. Finally, after your credit card has taken a beating, pop in to one of the many restaurants, cafes or bars and grab a bite. For something a little more upscale, don’t miss Top Chef Season 15 winner, Joe Flamm’s restaurant, Spiaggia. The “Mag Mile” is your one-stop-shop for everything you could possibly need. The Navy Pier is a top landmark in the city and is a great place to enjoy the skyline, go for a walk, see the Crystal Gardens, watch a movie, see a fireworks display, and of course…ride the Ferris wheel. Fun fact: George Washington Ferris invented the Ferris wheel, and the first one was built for the Chicago World’s Fair in 1893. Entrance to the Navy Pier is free, but if you want to ride the Ferris wheel, it costs $15. Urban kayaking is one of the most popular things to do in Chicago. After you’ve joined the architecture boat tour and learned all about the buildings, why not grab yourself a kayak and paddle at your own pace? There are a few companies in the city that offer kayaking tours on the Chicago River, or on Lake Michigan. But, if you feel like going solo, you can also rent a kayak at an hourly rate of around $25. Check out Water Riders or Kayak Chicago for more details. Have an Instagram account? Check out our Highlights stories from a week in Chicago! Paddling not your thing? 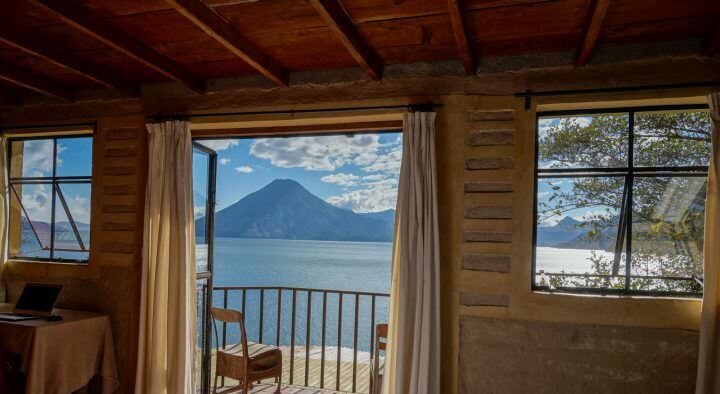 You can also rent electric boats and do a self-drive trip up and down the river. That’s right, you get to be the captain! The boats are easy to drive, just like a golf cart. The incredible thing about the fleet at the Chicago Electric Boat Company is that they’re all zero emissions. The boats can hold between 10 – 12 people and the rate is from $150 – $215 / hour. When you divide that price among a group of people, it really is a good deal. See the Chicago Electric Boat Company for details. This is one of the most unique things to do in Chicago with friends. Chicago has one of the hottest food scenes in the country. Even if you don’t consider yourself a total foodie, you’ll be impressed with the cuisine on offer in the city. If you’re looking for a succulent cut of beef, complimented with a robust glass of red, in a non-pretentious, yet classy atmosphere, then make sure you add RPM Steakhouse to your eating itinerary. This is one of the best places to eat in Chicago. Not only is the menu seasonal and varied, but the service here is on point. Plus, if you’re not into steaks, there are many other options on the menu including salads, seafood and chicken.I highly recommend the hamachi crudo, Mediterranean octopus, the rib eye, lobster, huckleberry cheesecake and chocolate cake. Yum! 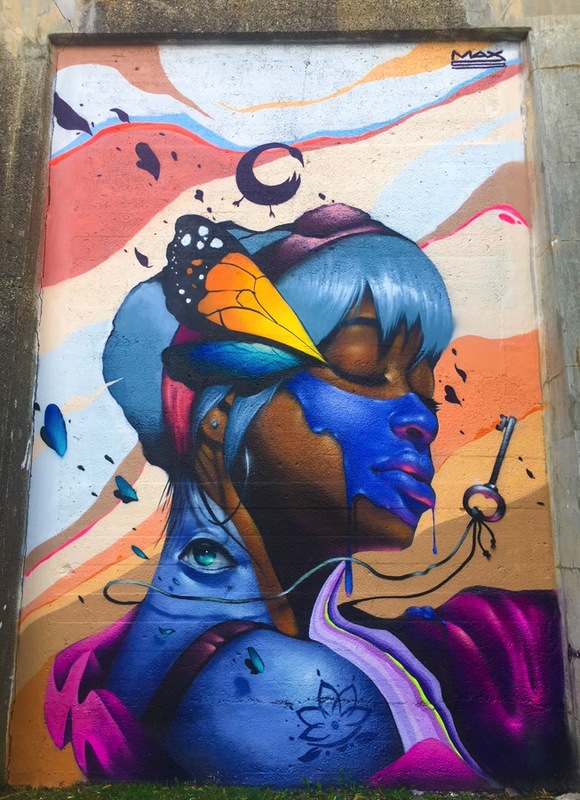 Chicago’s artsy side is prevalent in its many public museums, galleries and park sculptures, but if you’re into a more bohemian, graffiti style of art, you’ll want to search for some of the cool street art scattered around the city. You’ll find numerous murals in the Pilsen neighbourhood, plus a few dotted around Logan Square and Bucktown. The B_line corridor in the Fulton Market meatpacking district has been recently revived and is now filled with colourful illustrations. Spanning a mile, the walls below the elevated B_line train tracks have been turned into spectacular pieces from artists around the world. This area is a great example of an open air art gallery. Wander down West Hubbard Street between Peoria and North Ogden Ave. to find the artwork. To learn more, check out the Instagram page. You don’t have to be a hipster to enjoy an icy cold glass of craft beer, and what better place to do so than in Chicago, a city that loves its beer. According to this post, there are currently 72 breweries in the city and 132 in the suburbs! 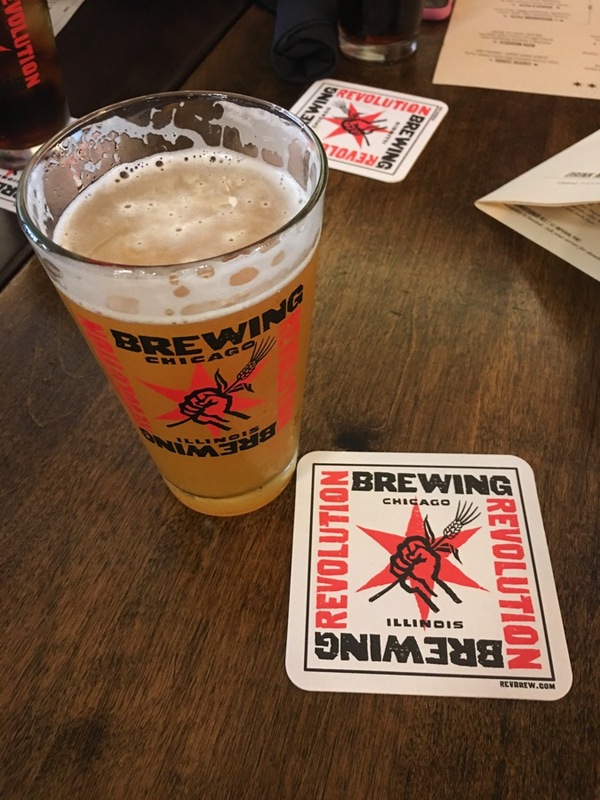 Obviously, you won’t be able to visit them all on a short trip to Chicago, but definitely check out the IPAs, Ales, Stouts and Lagers on offer at these craft breweries and taprooms: Revolution Brewing, Goose Island and Moody Tongue. Another great craft beer bar is the aptly named Map Room in Bucktown which has flags from around the world, and over 200 beers from various countries. Have fun wandering around and enjoying the best bars in Chicago! Millennium Park: home to the Cloud Gate / Bean sculpture, art and exhibition shows, concerts, outdoor workouts, outdoor concerts and dining. Maggie Daley Park: this activity filled park offers a climbing wall, playground, skating ribbon (ice in the winter, cement in the summer), mini golf, tennis courts and much more. Lincoln Park: located in the neighbourhood of the same name, Lincoln Park offers numerous lakeside cycling trails, beaches, museums, restaurants and a cultural center. This park is 1,208 acres (489-hectares) so make sure you give yourself some time to explore and relax. *Note: Grant Park actually encompasses Millennium Park, Maggie Daley Park, Buckingham Fountain and the Museum Campus. Touted as the theatre capital of the USA, there are over 250 theatre companies in Chicago! From comedies and musicals to ballets and orchestras, there is a plethora of performances to see in the city. 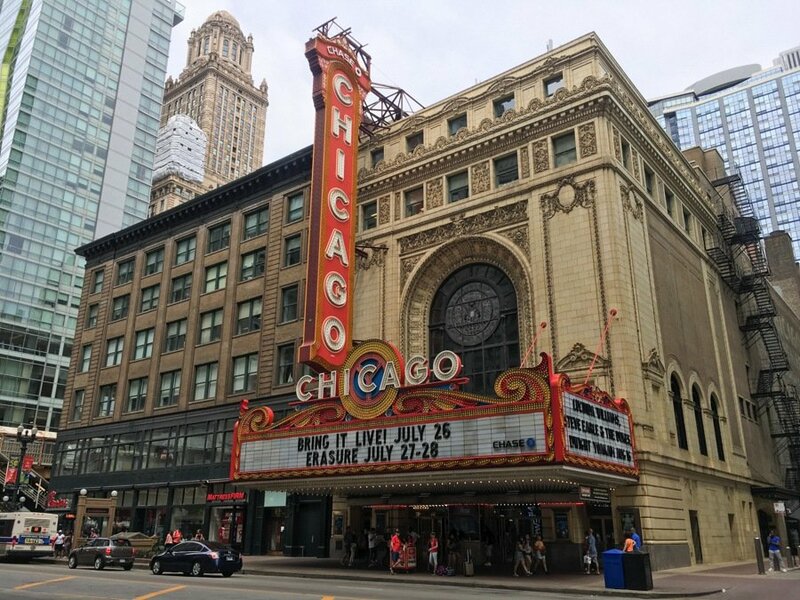 In the downtown / Loop area, check out the Broadway shows at the Oriental Theatre, concerts at the Auditorium Theatre and popular musicals at the CIBC Theatre. If you’re into comedies and improv, check out The Second City which is where the likes of Chris Farley, Bill Murray, Tina Fay and Steve Carrell started out. For a fun night out in Chicago, I recommend checking out a Blues club. This unique genre of music originated in Mississippi during the slave times in the 1800’s, and while those days are over, the soulful music has remained. The reason Blues music is so popular in Chicago is due to the Great Migration of African-Americans from Mississippi, Alabama and Louisiana. Many of the people who fled the southern states (due to racial discrimination) chose Chicago in hopes that they would find industrial work and a happier life…and with them, they brought their amazing music. Check out Kingston Mines, House Of Blues, Buddy Guy’s Legends and B.L.U.E.S. Most of these places also serve up tasty southern inspired cuisine. Fun fact: although blues music didn’t originate in Chicago, back in the 1980’s House Music was created by DJ’s and producers in underground clubs. The next time you’re dancing to electronic music, remember, you have Chicago to thank for those beats! Chicago is home to professional sports teams and depending on which time of the year you visit, make sure you attend a game. Whether you’re into hockey, football, soccer, baseball or basketball, Chicago has a professional team on offer. Many of these teams have won championships, but the most popular sports in the city are by far baseball and football. For baseball fans, head to Wrigley Field for a Cubs game, or to Guaranteed Rate Field for a White Sox game (click the links to see ticket prices). If football is your thing, make your way to Sodier Field for a Bears game. For hockey, cheer on the Chicago Blackhawks at the United Center. The Chicago Bulls basketball team plays at the United Center, while the WNBA team Chicago Sky is at Wintrust Arena. The Chicago Fire and Chicago Red Stars soccer teams play at the Toyota Park venue. Sports are a huge part of life in Chicago and Chicagoans are very passionate about their teams. Enjoy a live game alongside these awesome fans, or share in the camaraderie at one of the many sports bars. Watching sports with a hotdog and beer in hand is one of the top things to do in Chicago for sure. During the summer months from May 26 – September 1, the Navy Pier puts on a spectacular show. Make your way down to the pier on Wednesdays (9:30pm) and Saturdays (10:15pm) and enjoy the fireworks show, synchronized to music. Watch the sky light up while sitting on the pier, or from a boat on the river or lake. This is one of the best things to do in Chicago in the summer. Click here to learn more and to see the schedule. 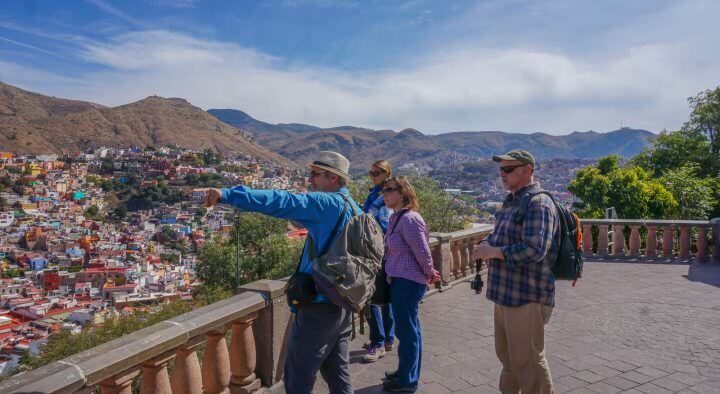 Walking tours are an excellent way to get a quick and informative introduction to cities around the world. We’ve joined walking tours in Medellin, Tirana, Berlin, Edinburgh, Florence and Rome (to name a few), and it’s always been an amazing experience. In Chicago, the guides are locals and are very knowledgable about their city. Expect to learn about the history of Chicago, the various buildings and where to eat and drink…all while being entertained by great storytellers. You can choose from architecture tours in various parts of the city, at different times of the day. This is one of the best budget-friendly things to do in Chicago. The tours are generally around 2 hours long, which is great as it doesn’t take up your whole day. As a bonus, the tours are “free” and you’re only expected to give a tip if you’re happy with the service. It’s more of a “pay what you like” situation. Click here to learn more about Free Tours By Foot. Don’t Miss Our Chicago Travel Video! Amazing! 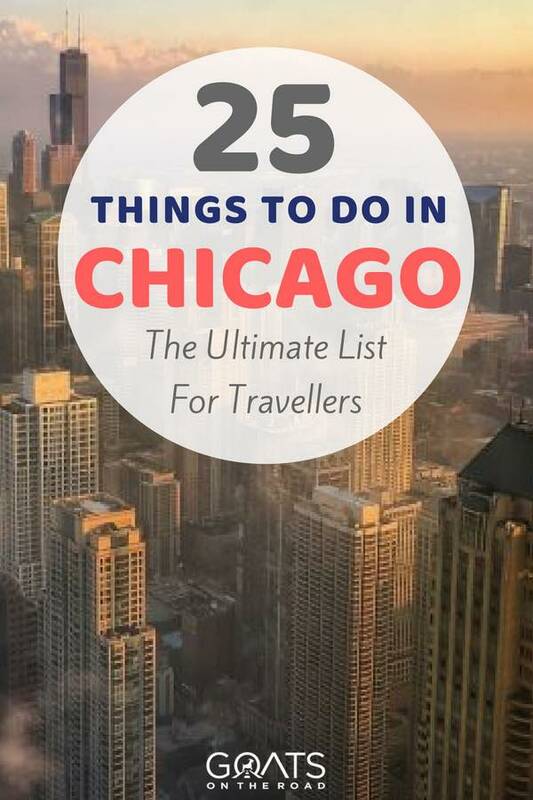 These 25 things to do in Chicago are exactly what we are going to do on our next visit there in Chicago. Hope we’ll have enough time to do all of it. Super excited. Great activities to do, thanks for information. Reading this fascinating article made me realize just how easy it is to navigate within the city of Chicago contrary to other beliefs and perceptions. If there is a city in America where you would be spoilt for choice as regards numerous activities and places, then it has got to be Chicago. The article has very comprehensively covered the major and the lesser known attractions and has provided sufficient information as far getting around the city is concerned. 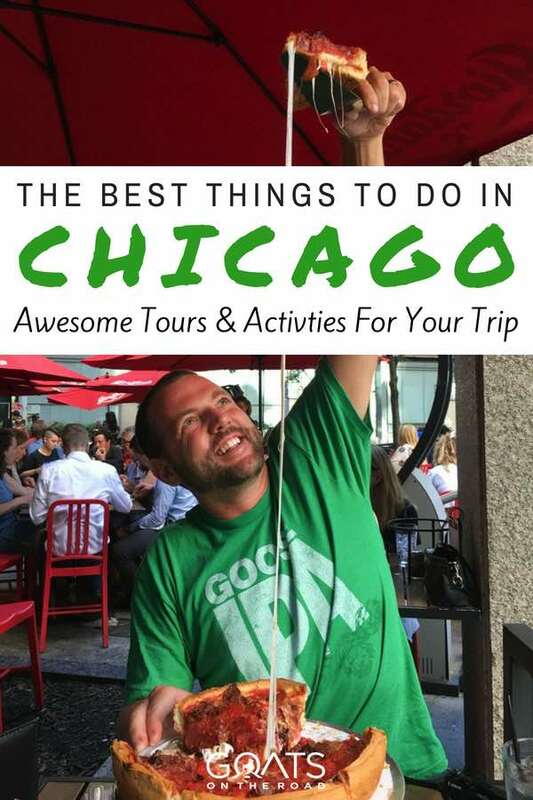 A must read for anyone interested in exploring Chicago in and out!